Senior, Cameron Branch, of the Oklahoma City Legion Homeschool football team, has had a banner week, leading his teammates to a huge upset victory over the Comets of Ardmore Dickson High School. Branch ran the ball 12 times for 231 yards and 2 TDs, for an average of 12.1 yards per carry. When his receiving and return yards are added, his totals exceed 300 yards on offense. On defense, he contributed to several key red zone stops, collecting 11 total tackles. The Legion victory led to a climb in the National Division One Rankings, landing the team to a best-ever 3rd place among homeschool rosters in America. While Central Virginia maintains a strong postion at #1, Lighthouse & NOAH slipped farther back on disappointing weekend games. The big surge of Noblesville & OKC Legion became the big news, this week. They move all the way to the #2 & #3 spots. 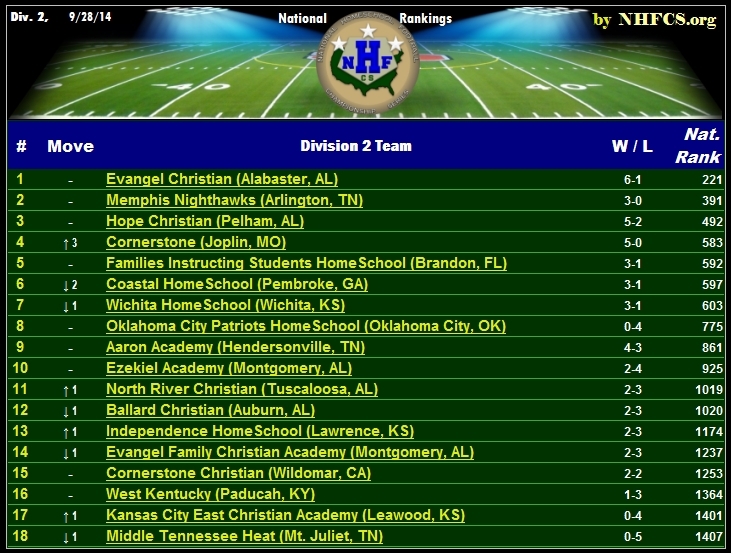 Christ Prep & King's Academy rounded out the top 10. Baton Rouge CHEF, Flint Warriors also moved into the first column on the strength of big successes. 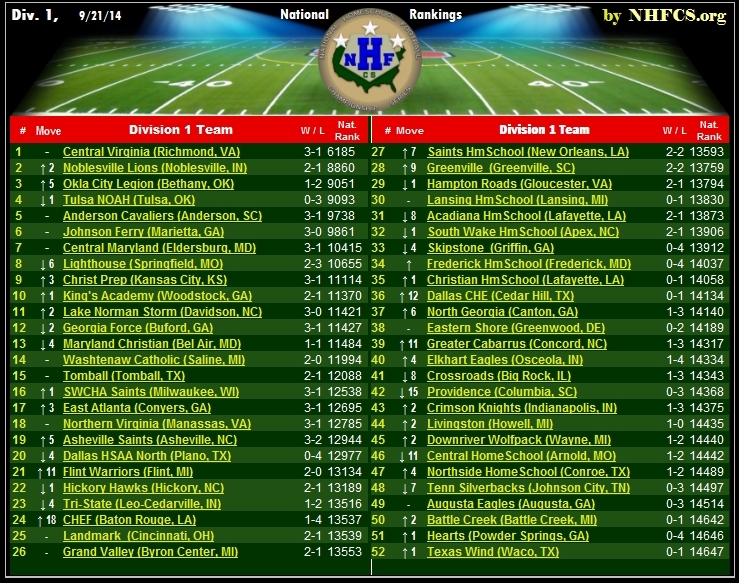 The NHFCS Rankings has removed teams who have not kept their game results posted to Maxpreps in recent weeks. 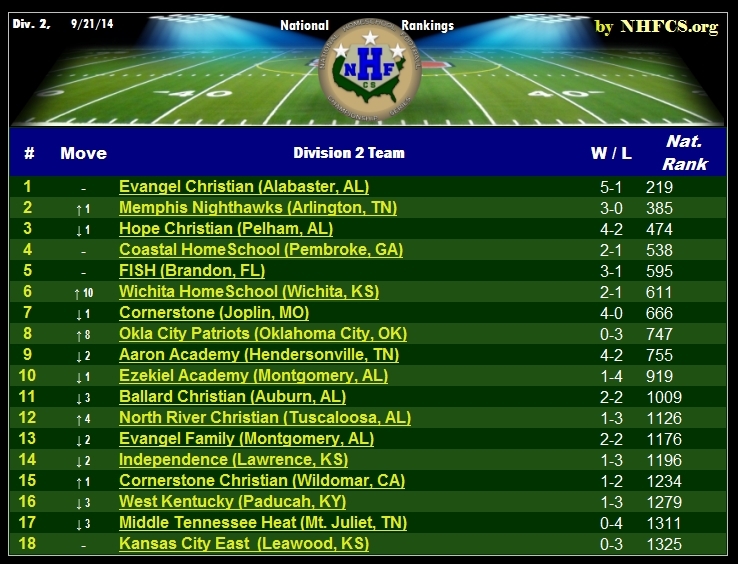 Evangel stayed secure in their top position this week. 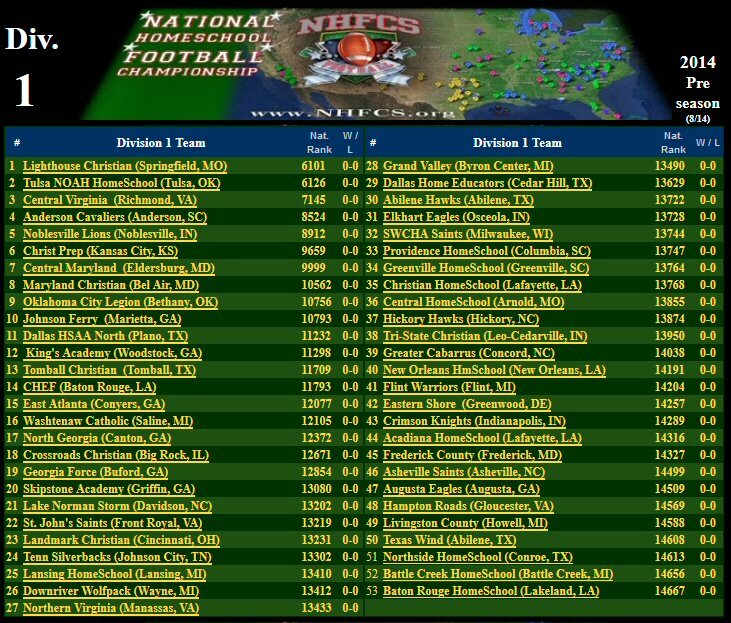 But the Nighthawks of Memphis are continuing their march in the charts, moving to #2, followed by Perennial powerhouse, Hope Christian. 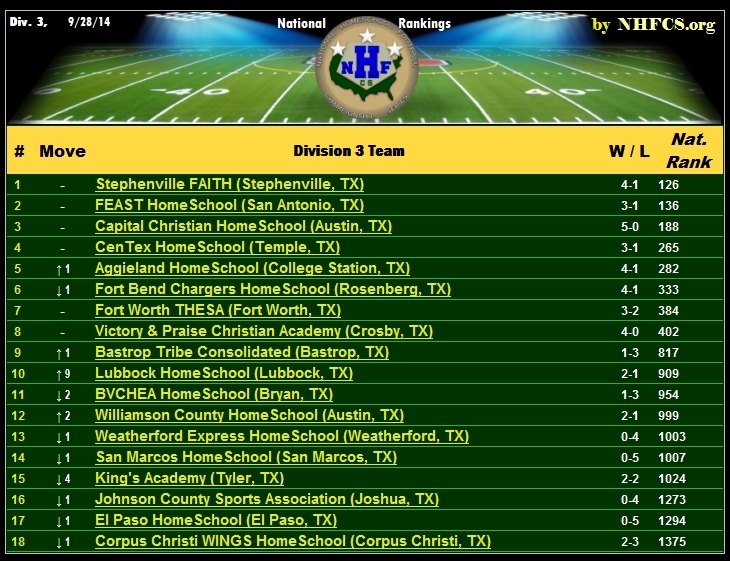 Maxpreps; the biggest surprises are the Wichita Warriors and OKC Patriots being added to the top ten. 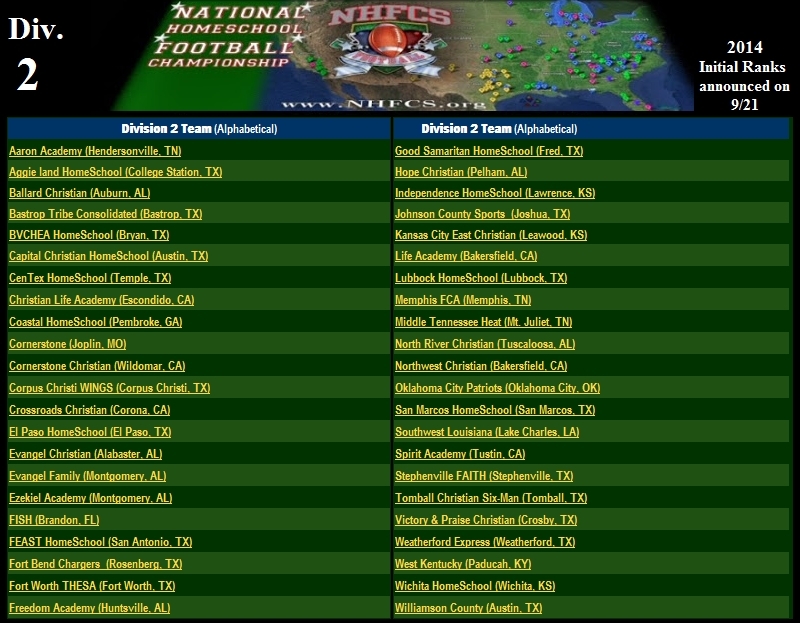 Expect up to 1 more teams to be added to the Div. 2 charts in the next week or two. Coaching varsity football is a collective effort. Your son's team will only be as good as the parents allow it to be. The athletes will only excel to their full potential if they have a full support team, and you are needed on that team! The head coach has his hands full and several things he'd like to do will never get done properly if he doesn't have people who "take ownership" of tasks and get them done correctly, thoroughly, and on time. Several of those tasks are clerical in nature. 1. A treasurer who collects athletic fees and pays bills. 2. A public relations director who stays current with media outlets and community groups. 3. A statistician who records game stats and compiles seasonal numbers for the athletes' future potential in college sports. Tell your coach or athletic director that you're committed to meeting one of the team's clerical needs, and ask another family to partner with you, so that either of you can get the job done if the other is unavailable on a given week. A postseason opportunity for national honors will take hard work in the summer preseason, and a dedication to the vision throughout the season. This is true of athletic discipline, but it's also true of team finances. A team needs to make preparations now, to see the team through to the November postseason events. A successful homeschool sports program is very doable if proper attention is paid to making athletic opportunities accessible to families of all income demographics. A bigger team roster results in team costs being spread out over a greater base and each athlete's portion becomes smaller. The media likes your team. The media will like your team more if they see more people coming to your games. 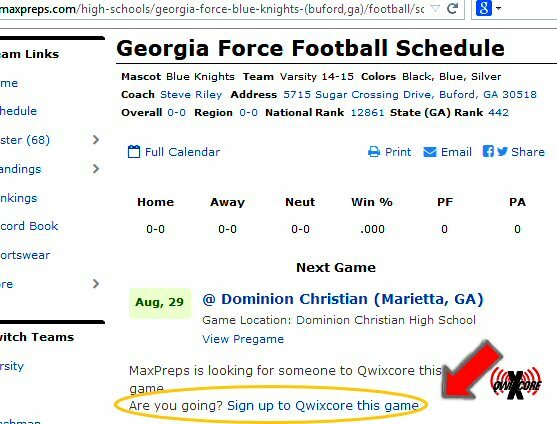 Begin contacting each media outlet in you market and let them know you're committed to supplying them with weekly information (scores, stats, unique storylines, etc.). 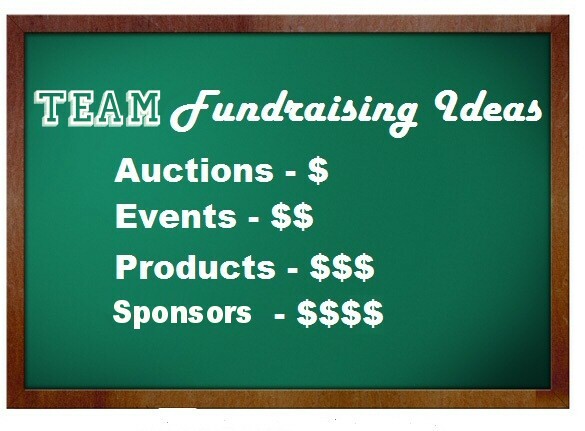 This draws more attention to your team and more ticket sales. It also gives your athletes the positive crowd support that generates greater performances. 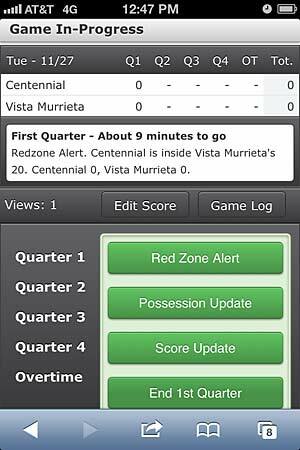 Texting in halftime and final scores to media can be done in just a few seconds, but it keeps the media attention on your team. Media sports coverage is a community service but it's also a money business. 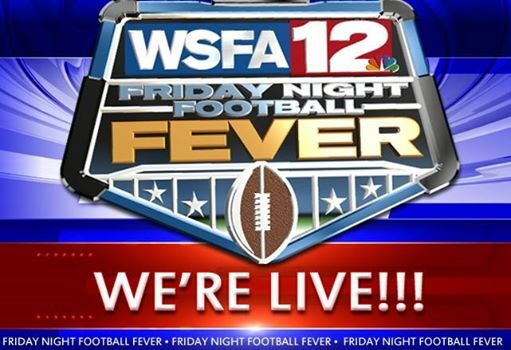 The local sports coverage is focused around keeping a large crowd for advertisers. They don't 'owe' you coverage, but if you make it easy for them, they'll give you more attention. Loyalty goes both ways. A coach demands the athlete's complete dedication for the success of the team. But an athlete needs that same dedication toward his full development. 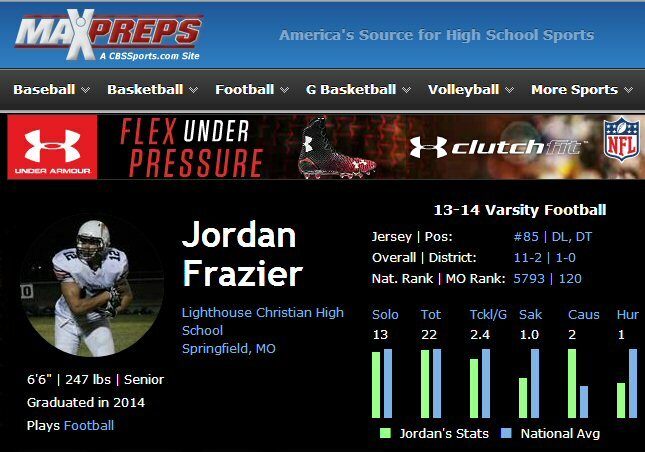 As he consistantly performs well, his statistics need to be tabulated and posted in sports media so that college scouts and media can watch him develop toward the college ranks. Without that statistical journal, the athlete is greatly hampered in seeking post secondary athletic attention and the scholarships that accompany it. 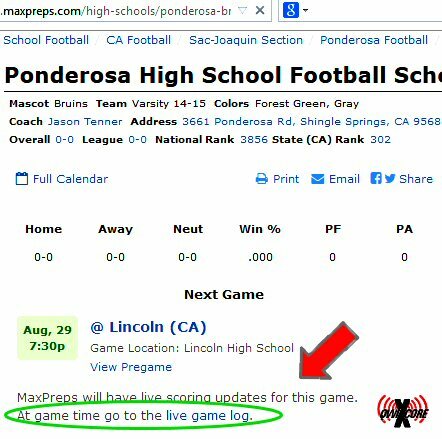 When the head coach (or his designate) watches post-game film and tabulates offensive, defensive, and special team stats, it's so important to get that info posted on Maxpreps, and to local and state newspapers. It needs to be posted by the Monday morning, following the game. 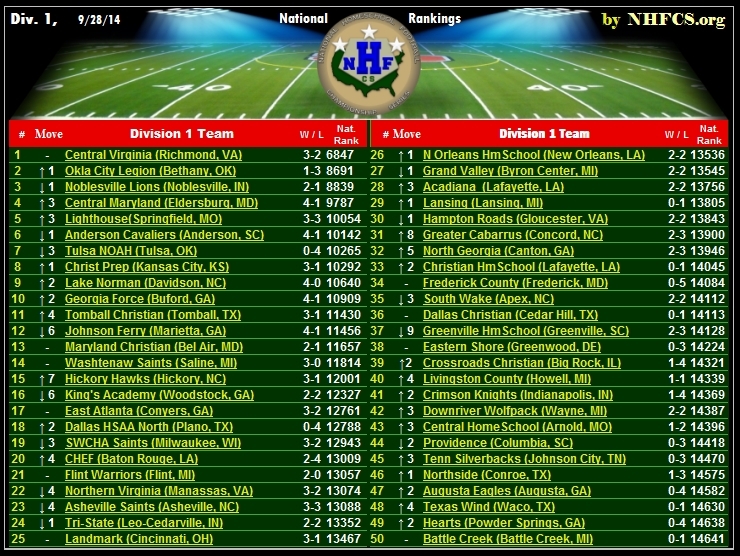 The coach should set up a separate Maxpreps access for each statistician.